Cryo-Cell is the world's first cord blood bank, having given birth to the industry in 1989. Today, we have been entrusted to store the cord blood from the babies of more than 500,000 parents from 87 countries. Cryo-Cell’s leadership is recognized worldwide as evidenced by the licensing of our technology and service offering to three of the world’s top seven private cord blood banks. Approximately 40,000 OBGYNs have recommended Cryo-Cell to patients or collected and sent cord blood to Cryo-Cell. Cryo-Cell's industry-leading, state-of-the-art laboratory and storage facility are situated adjacent to our corporate headquarters. This proximity allows our executives to directly oversee the daily operation of the most secure, efficient and technically advanced facility in the industry. Birth is given to the cord blood–banking industry through the establishment of Cryo-Cell International, Inc. in Clearwater, Fla., to cryopreserve umbilical cord blood stem cells for family use. Since this time, our mission has been to provide the world’s premier cryopreservation service and to support research and development initiatives for regenerative medicine. Cryo-Cell collects, processes and stores the first cord blood stem cells, on behalf of parents who had the tremendous foresight to envision the future of regenerative medicine. Cryo-Cell agrees to exclusively license our technology and service in Europe to Cryo-Save Group N.V., which today is Europe’s largest cord blood bank. This represents the first of many cord blood–banking companies to which Cryo-Cell will give rise. Cryo-Cell agrees to exclusively license our technology and service in Mexico to Cryo-Cell de Mexico, which today is Mexico’s largest cord blood bank. 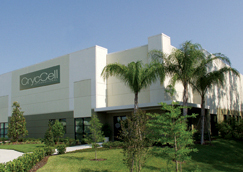 Many cord blood banking reviews have ranked Cryo-Cell de Mexico as the leading stem cell storage brand in Mexico. Cryo-Cell successfully saves the life of a three-year-old boy from his battle with T-Cell Lymphoma by using stem cells taken from his brother and processed and stored at Cryo-Cell. This was our first transplant, and today the boy is a healthy teenager. Cryo-Cell receives accreditation by the AABB, which is an organization dedicated to the practice and standards of transfusion medicine and cellular therapies to optimize patient and donor care in preparation for and during transplantation. Cryo-Cell agrees to exclusively license our technology and service in India to LifeCell International, which today is India’s largest cord blood bank. With the launch of its “Most Affordable Stem Cell Banking Solution,’ this Cryo-Cell affiliate has made affordable cord blood banking available to thousands of new families who previously could not consider the service. Cryo-Cell relocates our corporate headquarters and laboratory to a newly constructed, nearly 18,000-square-foot state-of-the-art, cGMP-/cGTP-compliant facility just outside Tampa, Florida. Cryo-Cell proudly announces that we have processed our 100,000th cord blood collection, which makes us the industry’s first company to reach this milestone. Cryo-Cell initiates a premium service that cryo-preserves cord tissue stem cells, which can differentiate into bone, muscle, fat and cartilage tissue. Cryo-Cell announces the adoption of a state-of-the-art cord blood–processing method known as Prepacyte-CB processing system. It enables parents to obtain the industry’s best possible cord blood collection for their babies. Cryo-Cell is awarded accreditation by FACT (the Foundation for the Accreditation for Cellular Therapy) for voluntarily adhering to the most stringent quality standards in the industry for cord blood as determined by an internationally recognized certification association. Cryo-Cell is the first U.S. private cord blood banking company to receive FACT accreditation. Cryo-Cell International introduces a new forward-looking, five-compartment cord blood freezer bag, which allows parents to get multiple uses out of the baby’s cord blood stem cells. Cryo-Cell also implemented other proprietary process changes to increase stem cell viability by up to 10 percent. With the acquisition of CORD:USE Cord Blood Bank, Cryo-Cell expanded its role in the industry to include public cord blood banking services. Partnered with Duke University, the program has provided cord blood for more than 600 transplantations and operates cord blood donation sites across the U.S in prominent hospitals such as Cedars–Sinai Hospital in Los Angeles and Baptist Hospital in Miami. Cryo-Cell announced the appointment of Joanne Kurtzberg, M.D., as medical director. Dr. Kurtzberg is a pioneer in the cord blood field, performing the first unrelated cord blood stem cell transplant, in 1993. She is an internationally renowned expert in pediatric hematology–oncology, pediatric blood and marrow transplantation, umbilical cord blood banking and transplantation, and the novel application of cord blood in the emerging fields of cellular therapy and regenerative medicine.